The change of control in the U.S. House of Representatives is unlikely to have a major impact on the business cycle unless there is a meaningful impact on taxation or spending. We don’t think either is likely. Most of the new laws enacted by the Tax Cuts and Jobs Act expire in 2025. This expiration date is not expected to change under the split congress. That said, the so called "Tax Cuts and Jobs Act 2.0" which, among other things, would have made many of those individual cuts permanent, is unlikely to pass under a Democratic House. We also expect that Affordable Care Act will stay in place while the Democrats control the House. Post-midterms, we're likely to face a period of gridlock in Congress, although we expect that raising the debt ceiling and discretionary budget caps should still get done. With modestly higher spending caps, we should expect a wider deficit and it will likely be difficult to find spending cuts to balance the impact of the deficit. Also, the current international trade agenda is likely to persist because the president can act alone on trade and sanction policies. What does this all mean? We expect a slight decline in yields because we have hit peak growth stimulus. Credit spreads may tighten modestly due to the gridlock and lack of new policy. U.S. equities shouldn't be materially impacted and will still perform based on earnings and the decisions by the Fed. The U.S. dollar is likely to weaken as the deficit inches wider. Democratic control of the House is likely to lead to more investigations of the executive branch. While that would have little impact on market fundamentals, it is not out of the question that there could be an adverse impact on investor confidence and sentiment giving rise to continued volatility. Stick to the plan (and call us). We believe, as we always have, that a prudent investor—one with a well-conceived, diversified and properly-monitored asset allocation—will do well in the long run. Not only are short-term moves to “time the market” rarely rewarded, history shows that they are often punished. We think investors should remain focused on market fundamentals and not to allow long-term investment strategies to be impacted by short-term swings related to investor sentiment or other factors beyond their control. If the asset allocation upon which we and our clients agreed made sense before market volatility began, it also very likely makes sense now, regardless of who controls what portions of our government. Our goal is to position clients with appropriate asset allocations that allow them to sleep at night, and to reach their goals over the longer term. We are always happy to discuss your situation in more detail, so please don’t hesitate to contact us with your questions or comments anytime. The information provided above is general in nature and is not intended to represent specific investment or professional advice. 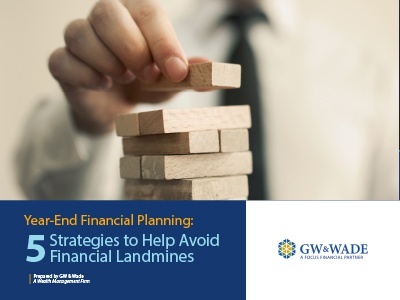 No client or prospective client should assume that the above information serves as the receipt of, or a substitute for, personalized individual advice from GW & Wade, LLC, which can only be provided through a formal advisory relationship. Diversification and asset allocation do not ensure a profit or guarantee against loss.